Disappointment can strike at any time, it can take any form and come at you from any directions. I was reminded of this hard truth yesterday. The wife and I decided to eat out last night. It’s not something we do very often, as it’s bloody expensive, so I was quite excited. See, we have very limited options in our town, so we usually go to Spur, a Wild West inspired steak ranch chain you’ll find in any town in South Africa with more than two tarred roads. And in this particular restaurant I always order the same thing. Because I can make steak, ribs or burgers at home any time I like, but not eisbein. For those of you unfamiliar with German cooking, eisbein is, in a word, heaven. 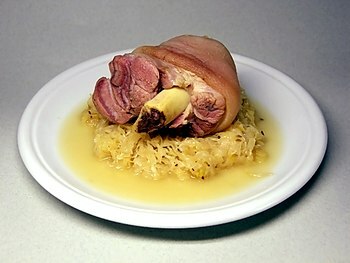 Eisbein is a pig’s knuckle – that part of the pig’s foot directly adjacent to what would be the ankle in humans. This restaurant grills it over open flames while basting it, leading to juicy pork meat encased in a crispy outer layer. The ultimate eisbein experience occurs when it is served with that other divine German culinary invention, sauerkraut (sour cabbage), but as Spur serves it with fries and onion rings is just as nice. Eisbein is a bit of a specialty item here and not that commonly (or cheaply) available (not to mention wildly unhealthy), and I don’t know how to cook it myself, so our infrequent visits to Spur is my only chance to enjoy eisbein. But lo and behold, when I opened the menu last night, no eisbein. They had removed it from the menu! Needless to say, dinner was ruined. I was forced to drown my sorrows in their “Warrior Combo”, a dietary travesty involving ribs, chicken, lamb chops and wors (South African sausage). It just wasn’t the same. What’s worse, I now have no idea when I’ll get to have eisbein again. Life can be needlessly cruel at times, don’t you think? As julle hier is kan jy Eisbein kom eet. I know the feeling. I hate it when I go to a specific eatery for a specific dish and it is not available. Makes you feel down right cheated, doesn’t it? Hmmm. Good point. I once spent a month in Germany and the only vegetables I got in that entire month were pickled. Wonder what that tells us of their national psyche. You’re forgetting roast chicken, steak and cheese pies, baked kumara, paua, and pavlova… plus many other things. Stop! I’m starting to drool over the keyboard! i can think of things more cruel than not eating eisbein..
Gahh hate sauerkraut. You can down one while showing your wife the parts of Germany you wanted to revisit. I’m not sure. This type of person also doesn’t like peanut butter 😉 so I see why you and I can never become good friends.